Before #FOAMed was invented the St.Emlyn’s team have been teaching online. Back in the day we adopted a moodle platform to teach our junior doctors in a way that did not rely on everyone being in the same place at the same time. This was invention born of necessity as we found that our weekly teaching sessions were rarely attended by more than 20% of our workforce. Shift work, increasing pressures outside of work and Gen Y were not able to make every Thursday morning and thus we were in a cycle of lonely trainers and unsatisfied trainees. Moving training to an online system using a VLE (Virtual learning environment) was a logical step and led us to set up the St.Emlyn’s virtual hospital and the St.Emlyn’s virtual classroom. These VLEs allow us to teach trainees (and consultants) irrespective of time and place and they have been a tremdous success underpinning the North West training program and our MSc at MMU. For new trainees in EM we designed and built a training course aimed at core skills in EM. Back then we had to create all the learning materials ourselves. A laborious task and sadly one that required a great deal of updating and monitoring, it also required us to produce everything in house which was great, but hard work and unifaceted in style. 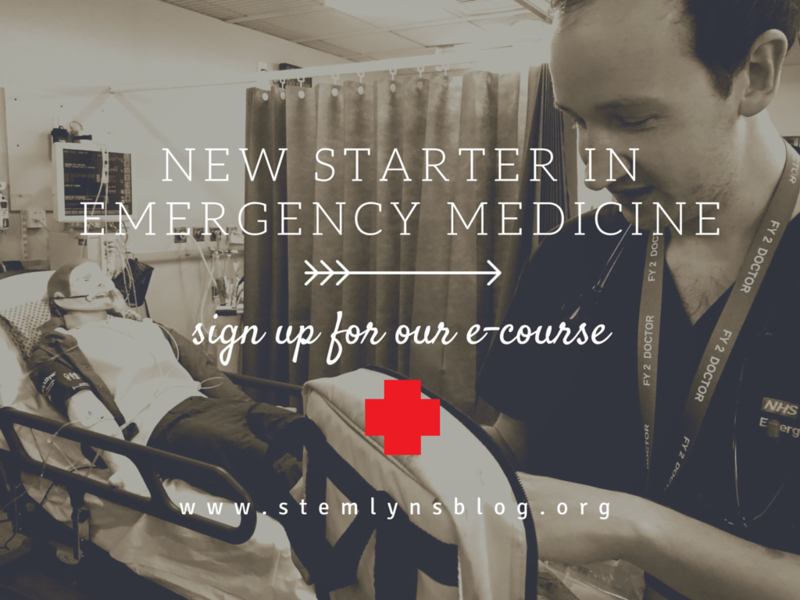 Since then #FOAMed has exploded and we now have a cornucopia of talent and material to choose from and thus we have redsesigned and relaunched our introductory course for new started in Emergency Medicine using the #FOAMed model. Completion certificates for portfolio use. We have 5 modules up and running already and we will be releasing more every week over the next four months. You can see an abbreviated version of the course here. If you want to use the course in Beta test mode send us an email with your name, role and the contact details of a tutor who is willing to support you and we will send you the access code. The course is FREE. It will be open access soon once we have beta tested the content. Help us develop this course by giving us feedback. This seems like a logical step for the St.Emlyn’s team. Helping those new to EM and new to #FOAMed to access useful, targeted and accessible learning with the ultimate aim to improve the care that we give to our patients.